Not only should every game be required to memorize quotes like "A Winner Is You" from Pro Wrestlnig and Metal Gear's "I Feel Asleep! ", they should add them to their every day lexicon of useful phrases. 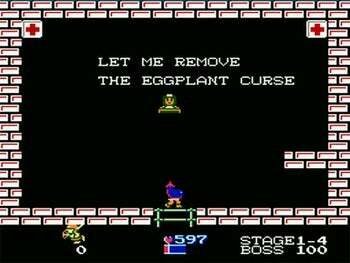 I cannot tell you how man times randomly shouting, "Let me remove the eggplant curse!" has gotten me out of a tough jam, mainly because it is a very small, unimpressive, and circular number.